How to Train Your Dragon 2 might be my favourite film of 2014. A bold statement to open any review but, I think, a fair one. I've seen the film twice - both times in 3D - and may even go again, to once more revel in the thrilling sensations of flight. As our heroes swoop and soar, my heart soared with them. The film certainly delivers on awe and wonder, but it also elicits sensations of another kind. How to Train Your Dragon 2 may be a family film, but it's unflinching in its depiction of the lasting consequences of violence. The film is a PG, and the violence is of the fantasy kind but there's nothing mild about this peril. I'm wary of revealing too much in a spoiler free review, so won't go into details, but no other film this year has had such a profound emotional effect on me. The film picks up several years after the end of How to Train Your Dragon. Where once vikings and dragons were mortal foes, the erstwhile enemies are now staunch allies; living in a much happier (and notably more colourful) Berk. This change for the better is thanks in no small part to Hiccup (voice of Jay Baruchel) and his nightfury, Toothless. 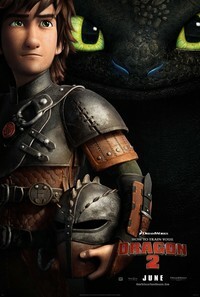 With the appearance of the mysterious Valka (voice of Cate Blanchett), Hiccup's life will change forever. It's perhaps rather odd that the identity of Valka should be revealed in the film's trailer . It's also strange that a number of other plot points are completely missing, severely limiting what I can discuss here. Without giving too much away, the sequel departs from the teen movie concerns of the first film to examine the no-man's-land of the twenty-something: no longer a teen, not ready to be an adult. Unfortunately, the emphasis is squarely on the men, with Astrid (voice of America Ferrera) not being given nearly enough to do. The addition of Valka to the film's roster of characters helps in this regard, but only just; and is something I'll examine in my alternate take. On a lighter note, there are some wonderful comedy touches with Ruffnut (voice of Kristen Wiig), who really gets to shine in this film. The film is also truly stunning, and the animation is captivating. The central characters have a humanity that never crosses into the uncanny valley, with Astrid and Hiccup sharing a warm and natural chemistry. It's the dragons that are the real draw though, and it's not just through depicting the thrill of flying that the film excels. On the ground the dragons are endearingly playful, with convincingly animalistic movements. Although I have reservations about its gender politics, How to Train Your Dragon 2 is, I think, a near perfect film. The film is admirably moral without being moralistic. Just as importantly, it is a joy to watch. Joining Hiccup and Toothless in their aerobatic feats, I can't help but echo the words of Valka: "This is what it is to be a dragon!" This review was published on July 18, 2014.